Though the house may not always win, it has excelled through the Elite Eight round of the 2016 Men's NCAA Basketball Tournament. Tied with Jeff Sagarin's ratings, Vegas has outperformed the field this so far spring. These leads are tenuous. 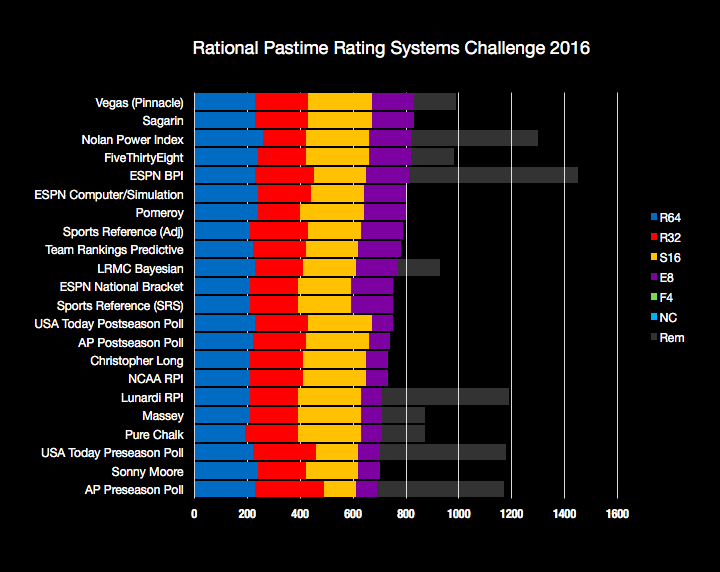 Depending on how the Final Four and National Championship play out, one of four different brackets may come away the winner of this year's Rating Systems Challenge. For the first time since I began this thought experiment, Nolan Power Index has performed well; the index leads the field in correct picks and is still in contention to finish as the top system. No system this year has all Final Four picks intact. No system even has three left standing. Nolan Power Index is one of the 13 systems with two picks remaining. Warren Nolan's rankings can claim this year's crown if Villanova, his system's #1 at the start of tournament play, wins it all. Should Villanova fail to cut down the nets in Houston, Nolan Power may still claim victory if the Syracuse Orange defeats the Wildcats in the National Championship. On the other hand, should the North Carolina Tarheels win the tournament, ESPN's Basketball Power Index will finish as the top bracket. In all other situations, Vegas will finish in at least a tie for first place. If the final matchup includes both Syracuse and the Oklahoma Sooners, then Vegas will be sharing that title with Jeff Sagarin's ratings. Whichever bracket does win, note that every system besides Sonny Moore has a chance of beating Pure Chalk this year. That is an impressive and unusual feat, indicative of just how "mad" this March has been. Quite "mad" indeed! I used the FiveThirtyEight bracket for my office competition and, despite that it's near the top so far in these rankings, I'm in the bottom half of the brackets in my own competition! Yeah, that'll happen. I've noted in past seasons that if you rely too much on one system, the best you'll likely do is around the 75th percentile, which usually isn't good enough to win your pool. I feel the best strategy is to use the best systems to gauge what upsets are likely AND unlikely to be picked by others. Also, create multiple brackets and enter as many pools as your budget will allow.